Kindergarten murals. The Little Mermaid - Ariel in the Underwater Kingdom. 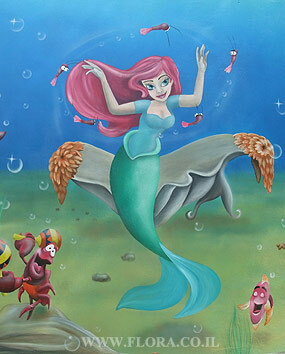 Ariel`s image was drawn In the center of an Undersea Kingdom while around her the Dancing images of Sebastian, Flounder and other residents of the Underwater Kingdom. In the background we can see the king Triton castle and sunken ship. Location: kindergarten ``Marina`` in Givat-Shmuel, external wall backyard. Drawing size: 2x12 meter. Painter: Flora.